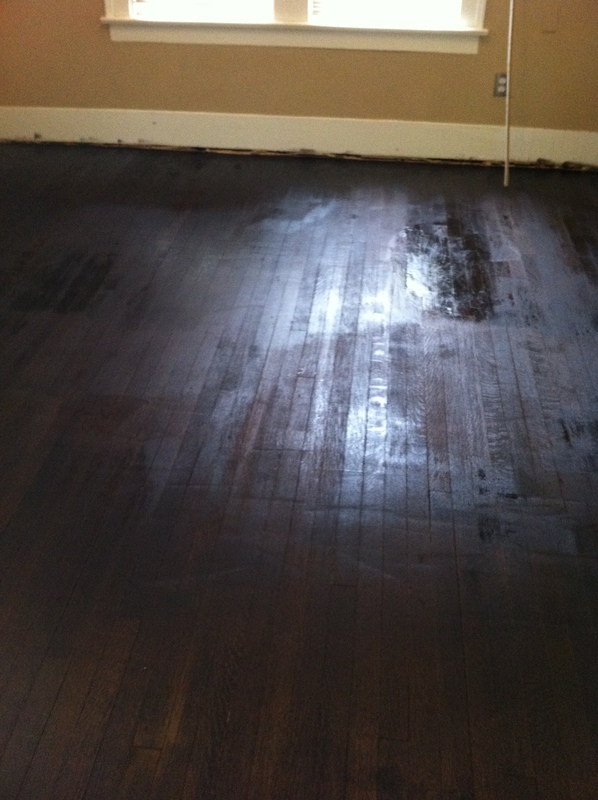 Now that the sanding is done as seen here in my prior post http://agirlcandoit.com/2011/05/09/how-to-refinish-hardwood-floors/ the floors are ready to apply the new finish. 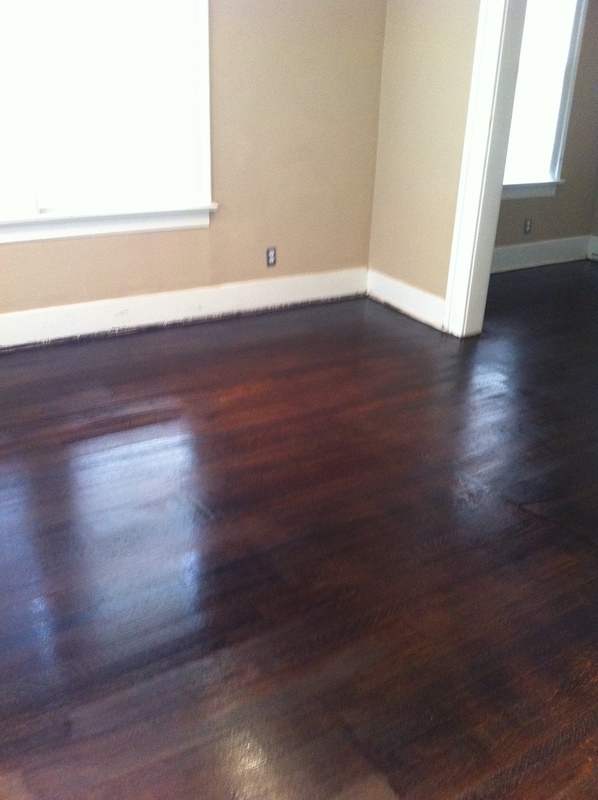 For hardwoods, I recommend a stain and 3 coats of polyurethane. 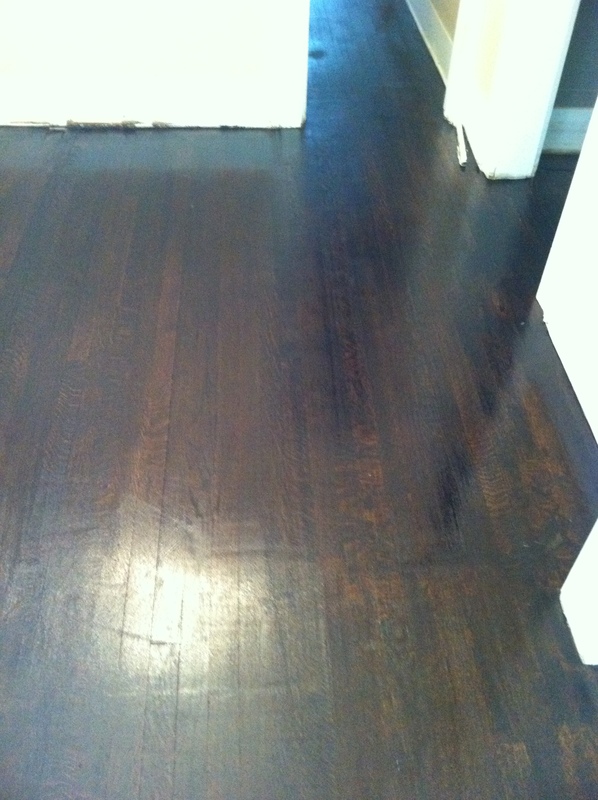 I chose MinWax’s oil based stain in Jacobean, which is a dark brownish black color like coffee beans. I chose the darker color not only for aesthetic purposes, but as I discovered, it hides imperfections in the floors very well. In small spaces, I recommend using a brush. 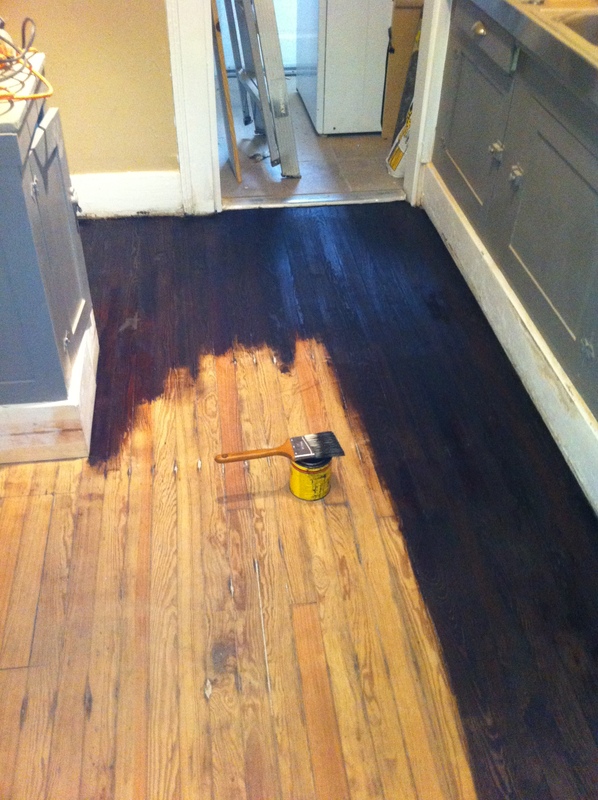 but in the larger areas, the stain is applied easily with a paint roller and an extension pole. 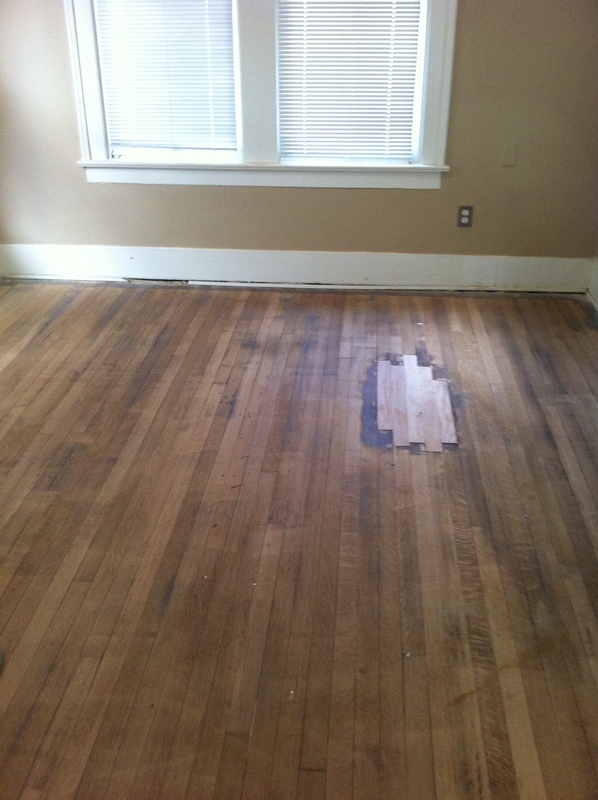 Here you can see how it hides all the imperfections and repairs made to the original hardwoods very well. When patching wood to be sealed, make sure you get the wood filler that says “paintable AND stainable”. The stain will be “tacky” to the touch for several hours. You don’t want to proceed to sealing until the stain is completely dry which typically takes at least 24 hours if not slightly more, especially in humid conditions. Once the stain is completely dry, you can proceed to sealing. Minwax makes a Polyurethane for Floors; I chose a satin finish which will look shiny when wet as you can see in the below photo but dries to a nice subdued finish. It applies easily with a lambswool applicator attached to a painters pole. After about 4 hours, the manufacturers label says that you can reapply a 2nd coat without sanding in between. If you wait to let the first coat dry, you should plan to sand the area with a fine grit sandpaper and remove all sanding dust before proceeding. In this case, I opted to reapply the 2nd and 3rd coats so that I could eliminate the sanding. A word of warning here and that is to wear a face mask meant to block odors because this stuff is very noxious! Allow at least 48 hours before walking on the surface. The day has finally arrived! 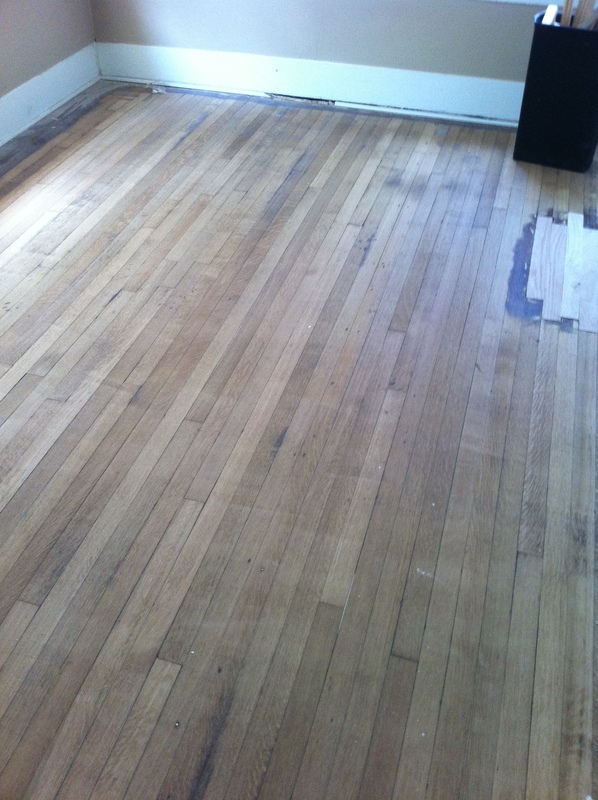 My 1920’s duplex I have been laboring over for MONTHS now is finally ready to have its floors restored!!! 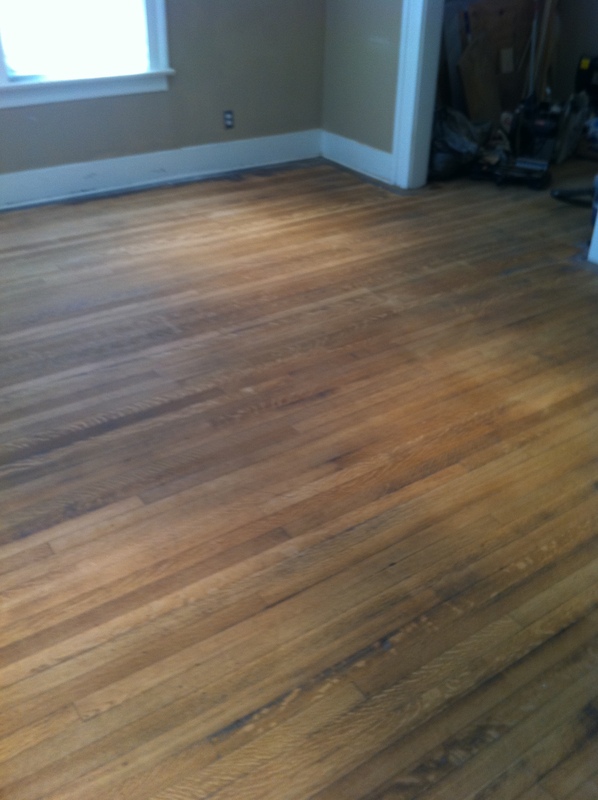 The original hardwoods are luckily in pretty decent condition with a few areas where the finish has completely worn off. 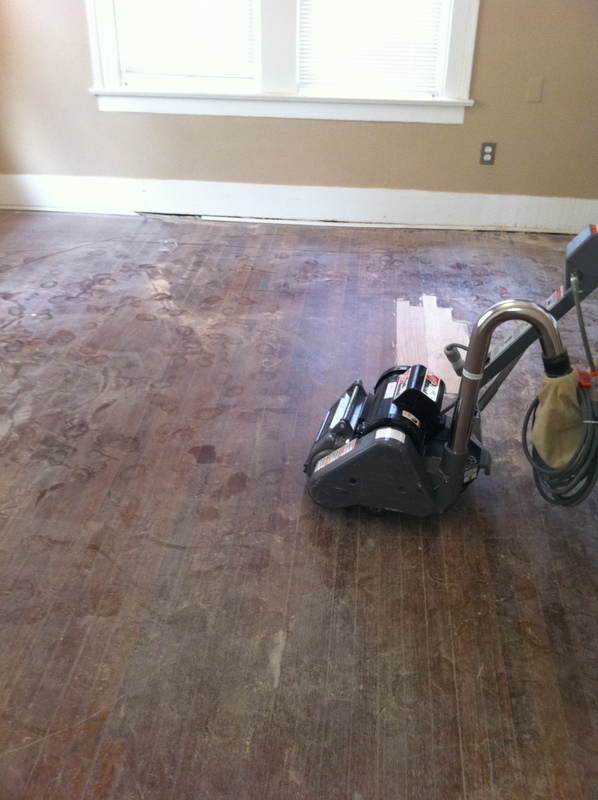 In order to renew the finish and restore the floors to their full beauty potential, I must first sand the old finish. 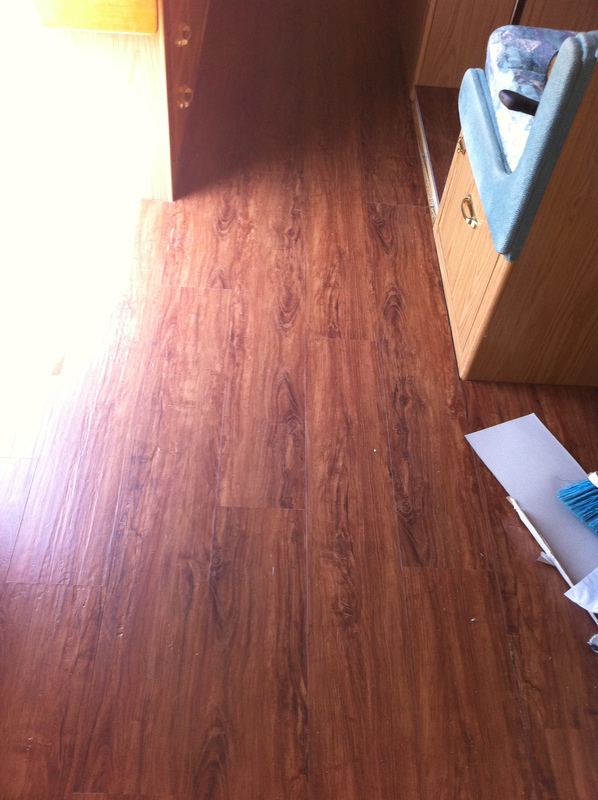 ** Disclaimer ** I have never attempted to refinish a floor before. I’ve refinished furniture, sure, but floors? What do I have to lose?? I hope I do not eat those words! Home Depot thankfully rents large tools that would normally cost the regular weekend do-it-yourselfers a small fortune to buy the same. For 4 hours and $32, I rented a belt sander which comes with a large dust collection bag. I also purchased a 60 grit belt and a 100 grit sandpaper belt for $9.97 each. 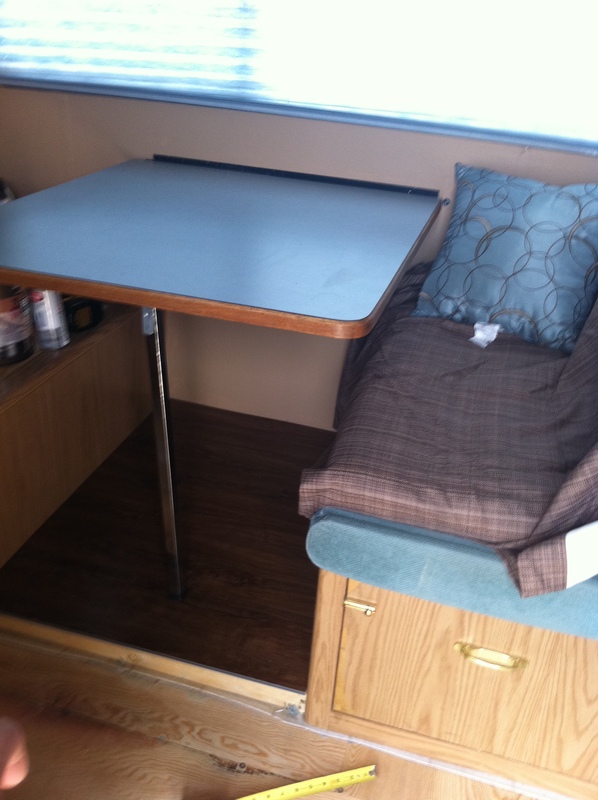 The tool rental people will ensure that it works before you leave and demonstrates how you will operate the tool and how to install the sandpaper. In this case, it is very easy since you simply slide the belts right on the sanding drum on the sander, no tools required. 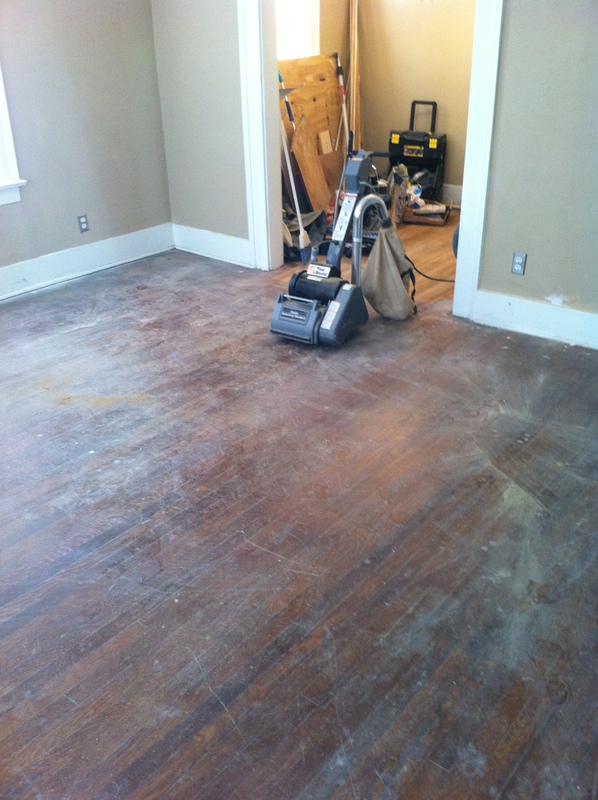 Using the courser sandpaper first, start on one side of the room and work your way across, always sanding with the grain. The sander has a handle that you can use to raise and lower the sanding drum while you maneuver the sander to each new row; *TIP* I did not do this at first and began noticing some unevenness in my sanding pattern so once I began raising and lowering the drum as I moved, it did much better. 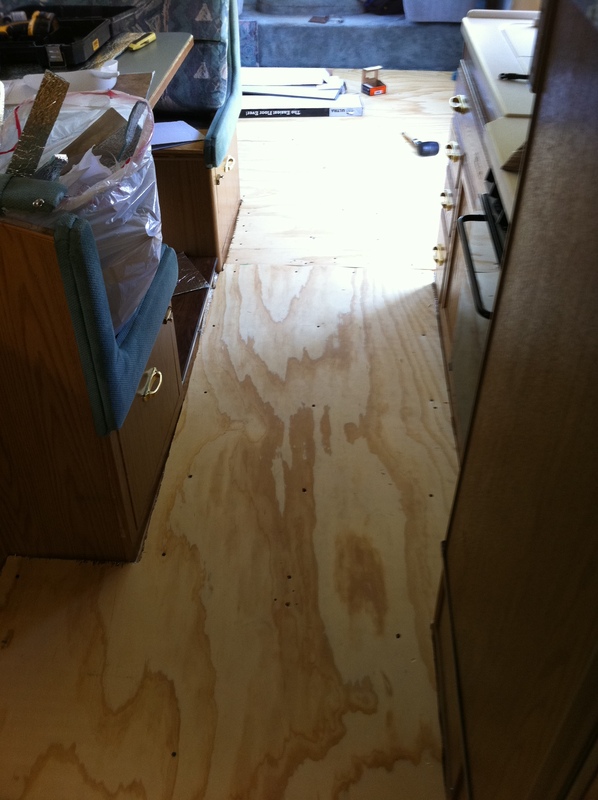 Once the room is finished with the first swipe, change to the lower grit sandpaper belt. Follow the same steps as above and you will notice that some of the unevenness is now easier to make disappear. Living room-before sanding; surface scratches disappear! Upon my tool return, I inquired about the next step, edging. Unfortunately, the gentleman explained that most people actually begin with the edges so that any imperfections can be concealed with the larger belt sander. Just my luck! Instead of renting a large orbital sander that may cause round sanding marks, I purchased a smaller 4″ handheld belt sander for $40 that I plan to use to go straight down the edges. I will use my hand sander to get into the corners. After I sand the edges, my next step will be applying the new stain, so I hope you come back to see the finished results. 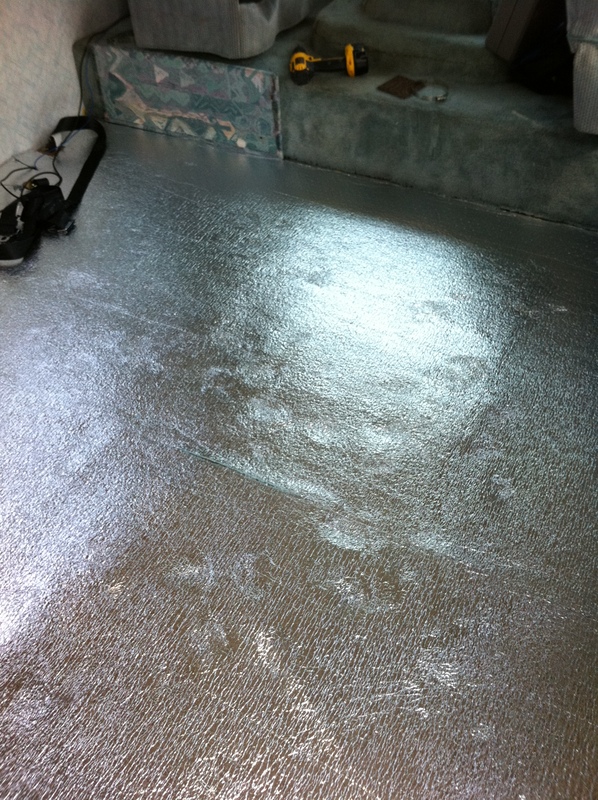 I must say, having spent 3 1/2 hours to sand 700 SF, it went fast and was very easy. I would definitely rate this job an easy one for a do-it-yourselfer. Continuing our series on following the progress at my friend’s home remodel, part of their wood flooring in the dining room had been damaged by a water leak from the adjacent kitchen. 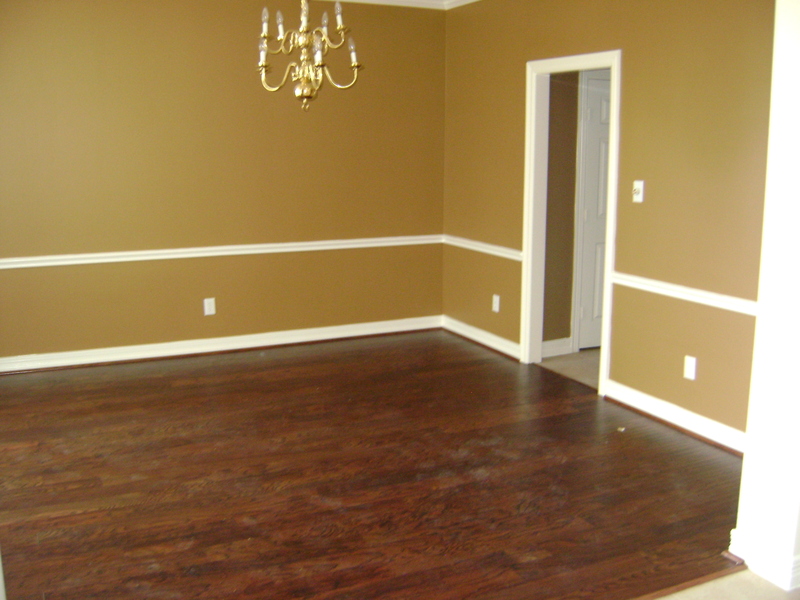 Wood floors add a lot of warmth and character to any room. 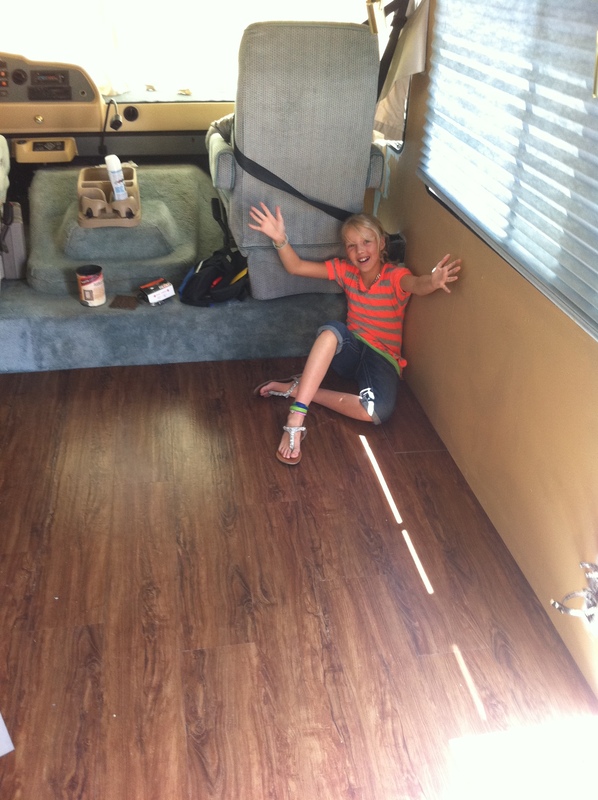 They are exceptionally durable and a good quality wood floor is meant to last for years and years. 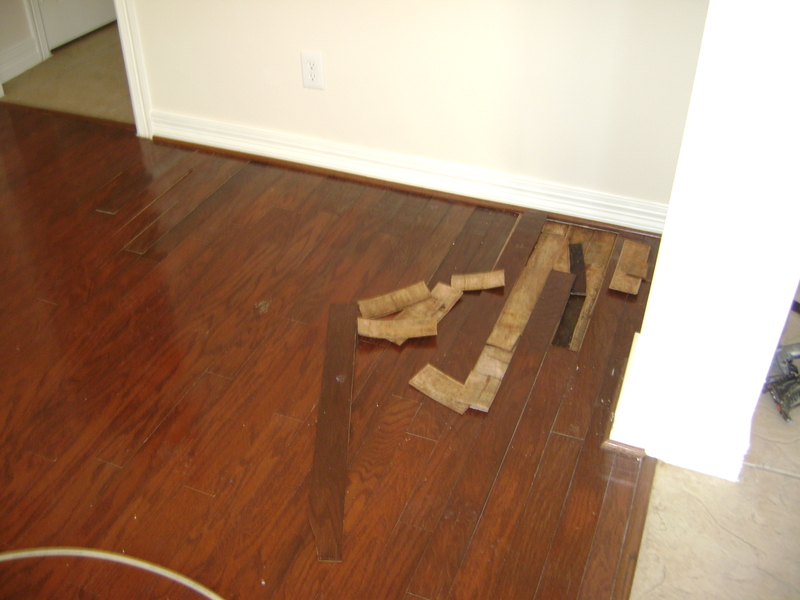 Unfortunately, in the case of my friend’s home, wood and water do not agree and the resulting buckled wood flooring was not salvageable.